Geisha Wonders is a Japanese-themed online slot created by NetEnt. It shares a progressive jackpot fund that is linked to two other NetEnt releases; Icy Wonders and Tiki Wonders. It’s a beautifully crafted slot with fitting artwork that offers an easygoing style of play. The special features of this video slot include wilds that create more winning possibilities and scatter symbols that combine for multiplier payouts and varying rounds of free spins. What’s more, free spin winnings are also doubled. This 5-reel, 3-row online slot has 30 adjustable bet lines and 4 bet levels. Coin values range from 0.01-0.50 allowing for bets of as little as 30p and as much as £60 per spin. There are two tiers of progressive jackpot up for grabs. Both the wonder jackpot and mega wonder jackpot are accumulated over time and can result in tremendous payouts. A beautiful Japanese garden complete with cherry blossoms and ornaments provides a stunning backdrop for this oriental slot. The prize symbols are filled with icons that are synonymous with Japanese culture. These include bonsai trees, koi carp, handheld fans and paper lanterns. Wooden wind chimes and a tweeting bird create a serene atmosphere for this game. Hit a winning payline and excerpts of traditional Japanese music play to celebrate. An old Japanese proverb reads ‘If you’re fully prepared, you need not worry’. With this in mind, it’s a good idea to learn the game’s features and prize symbols before diving in. Click on ‘Paytable’ in the bottom left to see how Geisha Wonders works and see how each bet line is mapped across the reels. A gold star is used to denote the progressive jackpot symbols. To trigger the wonder jackpot you will need 4 stars and 5 stars are required to hit the mega wonder jackpot. It’s possible to win on any spin but your chances of winning one of the progressive jackpots will improve the more you bet. The wild symbol looks like a Buddhist statue. Wilds can take the place of all symbols except jackpot symbols and scatter symbols. Land 5 wilds on an active payline to win a 10,000 coin return. This is a huge win compared to the best paying standard symbol; the cat pays 1,000 coins for 5 in a row. Prize symbols must appear in succession from leftmost to right for a bet line to win. The scatter symbols are represented by a Geisha holding a sun-shade. Scatter symbols can land anywhere across the reels and combine, without the need to be on the same bet line. Get 2 or more and a multiplier will be applied to your overall bet for that spin. It’s possible to win up to 400x your total bet for getting 5 scatters. Spinning in 3 or more scatter symbols will initiate a round of free spins with double winnings. It’s possible to get as many as 30 free spins for 5 scatter symbols. Free spin wins are given a 2x multiplier, with the exception of jackpot wins and additional free spins won in the free spins game. Setting up the game is really easy to do and takes a matter of seconds. Firstly, click the ‘Bet Line’ button to determine how many active bet lines you wish to play, noting the path that each one takes across the reels as you add them. Next, choose your ‘Bet Level’ which will act as a multiplier of the number of coins on each active bet line. Finally, select your coin value, remembering that the overall cost per spin will be dependent on all three settings. For example; with all bet lines active, a coin value of 0.05 at bet level 2 will cost 3.00 per spin (0.05 x 2 = 0.10 x 30 bet lines = 3.00). The Max Bet button will automatically set the number of paylines to 30 and bet level to 4 before initiating a spin. It’s therefore, advisable to set the coin value before you use this feature as the cost per spin will be 120 times the coin value displayed. Use the four icons on the bottom left of the screen to adjust your game preferences. You can toggle audio with the spanner symbol and control the overall volume with the the speaker icon. Access the help menu with the question mark icon. The Auto button opens up a control panel for the Autoplay feature. 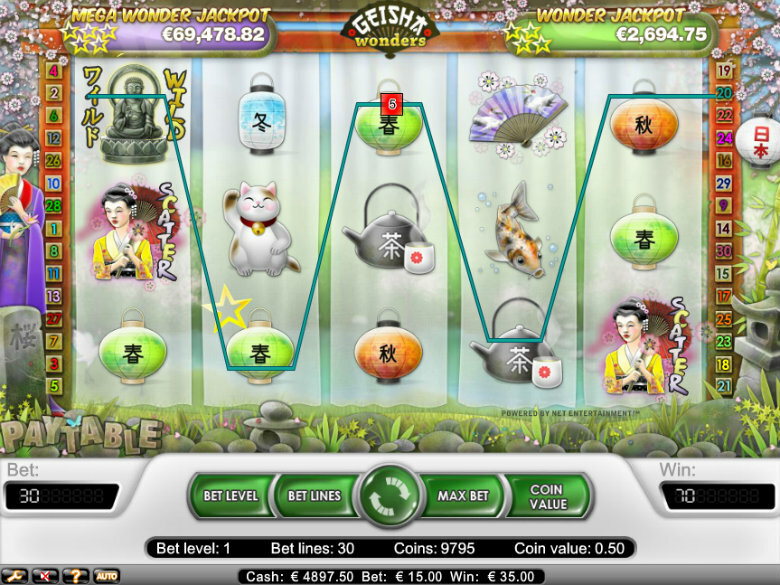 Start playing Geisha Wonders video slot by clicking the green button with white arrows in the centre. You can conduct a skill stop by clicking the spin button again while the reels are still spinning. Use Autoplay if you wish to initiate automated spins instead of playing manually. Geisha Wonders online slot can be played at both Hello Casino and Redbet Casino. You won’t see it in any welcome packages these days but it does make a fairly good choice for playing through wagering requirements of an online casino bonus. This is because it’s quite a low-risk slot to play that pays out regular small amounts to prevent your balance from going down too quickly. The regular appearance of wild symbols is a key factor in this game paying out often. Wilds seem to spin in every few rounds and create winning combinations from what would otherwise be a dead spin. Scatter symbols are not so active and this means you can expect to wait a while for free spins. However, the wait can be worthwhile for double paying free spins. We only had a couple of winning combinations during a round of 10 free spins but still managed to win 350 coins. The progressive jackpots are elusive and should be viewed as an added bonus. It’s completely possible that you could win a jackpot on any spin but the fact that they are shared with other slots makes it unlikely. Is Geisha Wonders The Right Slot For You? 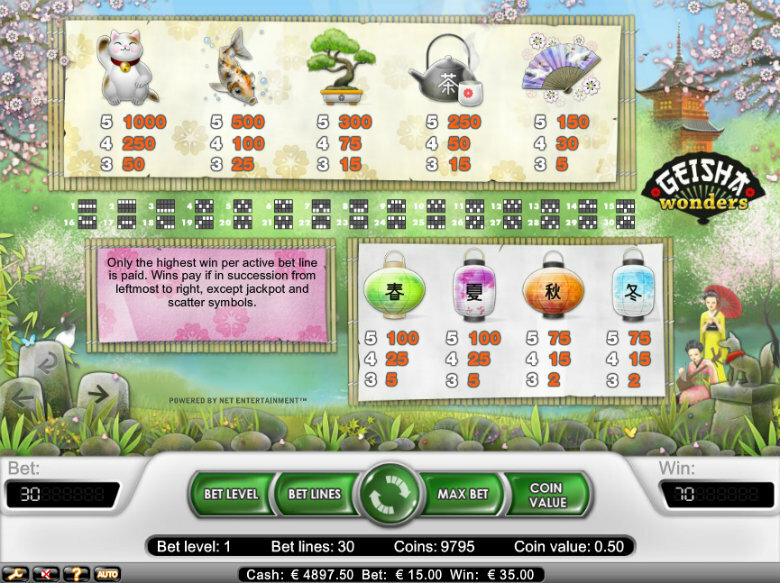 Geisha Wonders slot is a low variance game that pays out regular medium to low prize amounts. The RTP is quite low at 93.1% which gives the casino a house edge of 6.9%. This is definitely something to bear in mind, although losing streaks do not last long and the steady stream of minor wins allow for a lengthy play session with good bet management. This slot is super-easy to play and you can rattle through a considerable amount of spins in no time. This is because there are no animations or bonus games to break up the gameplay. The free spins round plays out in a similar manner of the base game but the use of an uptempo backing track adds extra excitement to the feature. Geisha Wonders has been around for a while now and does not have the detailed graphics of more modern NetEnt slots like Koi Princess or Lights. Nevertheless, it is an enchanting game in its own right and the prospect of hitting a progressive jackpot gives it added appeal.